Some paddlers race, while others just float downriver. Friday and Saturday, Aug. 5-6, Schmidt Recreation Complex, 2944 Humbert Ave. Grab your canoe or kayak (and a paddle, of course), for the “largest paddling event in the country,” The Ohio River Paddlefest. For its 15th anniversary, the event hopes to draw thousands once again for an 8.9-mile trip on the Ohio River. Paddlefest, presented by St. Elizabeth Healthcare, benefits Outdoor Adventure Clubs of Greater Cincinnati. That organization works in 19 inner-city high schools in Ohio and Northern Kentucky to get teens out in nature to paddle, fish, hike, climb and camp year-round. Paddlefest will kick off on Friday (4-6 p.m.) with Paddler’s Party for a Cause at Schmidt Recreation Complex. Paddlers may complete their registration and drop off their canoes and kayaks as they enjoy live music, food trucks, craft beer from Blank Slate, a silent auction, raffle and gear swap. Overnight camping for $15 per vehicle will be available. Parking and admission are free, thanks to Subaru Dealers of Greater Cincinnati. 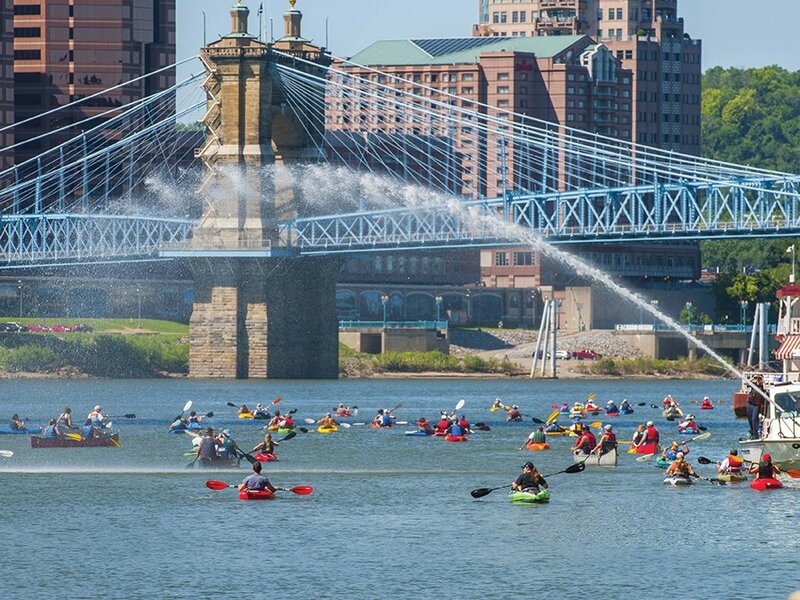 On Saturday, the U.S. Coast Guard will close the river to commercial and powerboat traffic from 7 a.m. to 12:30 p.m. as participants paddle from Schmidt Recreation Complex to the finish line at Gilday Riverside Park, four miles downstream from Paul Brown Stadium. Paddlers can also participate in the fifth Annual 4.2-mile “Midwest SUP for the Cup” stand-up paddleboard race, the largest such event in the Midwest. SUP racers will start at Schmidt at 7:15 a.m. and finish at the Suspension Bridge. New this year is the Half Way Celebration hosted by the City of Covington at Covington Landing. It will include live music, refreshments and exhibits, as well as the opportunity for paddlers to tour Mill Creek up to the MSD Barrier Dam, an 8-minute paddle from the Ohio. To wrap up the event, the Finish Line Festival at Gilday Riverside Park, sponsored by the Cincinnati Recreation Commission, will feature live music from Public Figure, food trucks, craft beer from Taft’s Ale House, SUP racer awards and exhibits. Shuttle buses will take paddlers back to their vehicles.